How Much Does It Cost to Remove Old Wallpaper in 2019? A lot of variables affect the total cost of removing wallpaper. Although most professionals will try to include these variables into their estimate, they cannot foresee every issue. Many are obvious, such as the number of layers of wallpaper, vaulted ceilings that will require special ladders or scaffolding, tight spaces like bathrooms, and others. Some unexpected matters are not as clear without further inspection. Harmful chemicals, such as asbestos, arsenic, lead, and others could be hiding within the paper, the primer, or the adhesive used to hold it in place. Some of these unhealthy or downright deadly chemicals could cause the contractor to shut down your project, particularly polyvinyl chloride (PVC) products, until professionals can contain the hazard. These cleanup procedures must get completed by professionals. Therefore, it could add hundreds of dollars to your wallpaper removal project before you can hang new wallpaper or apply paint. However, without special conditions or preparation, wallpaper removal usually costs about $3.00 per square foot. Most homeowners pay $400 – $1,000, though the national average is $750. This can greatly impact the price of your new wallpaper or painting project, keep reading to learn what impacts the cost. There are several methods to remove wallpaper and the process used, as well as the equipment needed, will affect the price you will pay. Most DIY and even professionals use three basic methods of removal or a variation of stripping, steaming, or saturating and scraping. Stripping is the most uncomplicated method of removing wallpaper because of the ease of removal and clean up. It will typically cost $.50 to $1.50 per square foot. Therefore, you can figure $62.50 up to $187.50 to remove 125 square feet of wallpaper. If you are unfamiliar with determining a room or wall square footage, consider our square foot calculator. This method of removing wallpaper uses an electric steamer. The wallpaper is perforated with small holes, and the steamer softens the adhesive to loosen the wallpaper panels. Usually, the wallpaper will just strip right off after that. The cost for steaming is about $1.00 to $2.00 per square foot, though the contractor might charge more to rent the machine. This procedure is often the most labor-intensive and costs $3.00 or more per square foot. 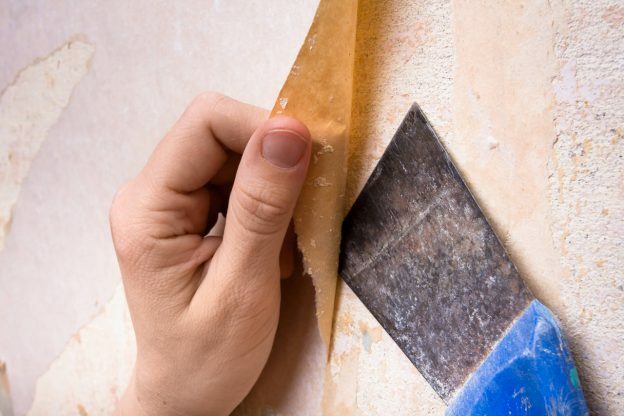 When the wallpaper can’t be stripped or steamed, it might require scraping. You or your contractor will have to perforate and saturate the wallpaper strips with a treatment, and let it soak in for a while to loosen the adhesive. Then a putty knife or scraper is used to peel it off the wall. The question of whether to use a contractor or a handyman/woman is generally a personal choice. A handyman usually charges less than a contractor because in many states there is no requirement to have a state license. However, when using a handyman, the answer usually comes down to experience. Plus, it would be wise to check their references and make sure they have the required equipment and liability insurance. Whichever professional you use to remove wallpaper, it is advisable to get a minimum of three estimates, check their recommendations and credentials, and compare not only the price but what they say they will do for that price. To avoid paying for estimates, use our free estimate locator to find proficient wallpaper professionals near you. If you’re installing new wallpaper, you might also be interested in our wallpaper calculator to estimate your materials.